Netvibes, a company that provides social media dashboards and news aggregators for brands and agencies, is debuting a powerful new analytics platform tonight. Netvibes’ new social analytics and monitoring platform is launching in private beta but won’t be available to the general public until later in the month. As we wrote last year, Netvibes launched Instant Dashboards, which allows users to enter a keyword on NetVibes’ site to pull up an instant dashboard that automatically collects all of the latest photos, videos, news, feeds, search results, Twitter conversations and more around that topic in realtime. The company’s new offering, Social Pack, is complimentary to the Instant Dashboard product, giving brand managers the ability to monitor and analyze at the same time. The platform’s Social Corpus gives you open access to add and control exactly what sources (blogs, influencers, news feeds) to pull data from. 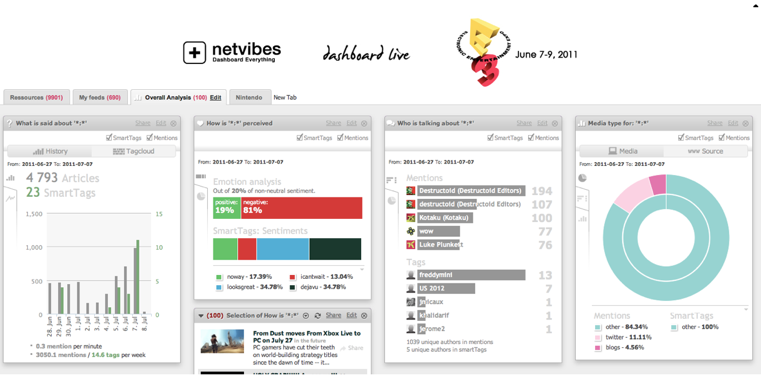 Plus, Netvibes features a built-in library of more than 200,000 original content feeds and apps to choose from. Similar to analytics platforms like Radian6, Netvibes tracks mentions and topics and gives brands insight to make sense of this data. The platform will identify trends, sentiment, influencers and ideas. You can dig pretty deep with data as well. For example, not only will Netvibes tell you who your top influencer is, but the technology will also show you which blog the influencer write for and what is being siad about a brand or product. And Netvibes will instantly create a new app just to analyze those specific keywords revealed by that one influencer and track them over time. Netvibes also allows you set specific tags to track certain mentions from specific sources. Netvibes allows managers to create an unlimited number of advanced alerts to automatically monitor the effectiveness of campaigns, brand reputation, competitors and even trigger actions, like adjusting campaign budgets, a newsletter response or invoking a URL. Alerts can be sent to any mobile device in real-time. While the Social Pack platform combined with the news aggregator platform is certainly an information overload, it could be a comprehensive tool for brand managers. Already many well-known agencies and brands are already using Netvibes’ enterprise offerings including Digitas, Coca-Cola, and L’Oreal. Of course, the enterprise dashboard isn’t cheap. The entire Social pack and Dashboard costs $15,000 for dashboard setup, then $2,000 per month. But clearly big brands are shelling out the cash for Netvibes product. And the company is profitable on a net income basis.